Following a slight delay, the we finally received the day four CSM X Meeting Minutes form the recently held Summer Summit. Detailed in the Minutes was a session on Factional Warfare and PvE (mainly because the same team is working on both). Normally, these two things are quite far apart and I don’t think I have ever covered PvE in Lowlife. However, FW and PvE are intertwined in this session and relate to each other, so today’s Lowlife will be an attempt to look at what was said and predict what that means in reality for the players in and around Factional Warfare. Anyone who has played themepark MMOs will know this one. Basically, it’s a type of quest you can do over and over again, once a day, in order to get some type of reward. Well, now it’s coming to EVE in the form of the Tribute System. The general design goal of these daily activities is to offer an incentive for people to log in, and it’s already a tried and true method in other games. At this point, CCP Affinity let us know that the idea is that you will be rewarded with any “dungeon completion” and that it will be tiered at one to five. Basically, this will mean typical PvE activity such as completing or hacking a site for a payout in ISK. The more difficult the content, the higher the tier and payout. The option of LP rewards was discussed at the summit, but as this would heavily affect the LP market and FW players income, it was quickly dismissed. Thank god for that. Or is it Mission Impossible maybe? 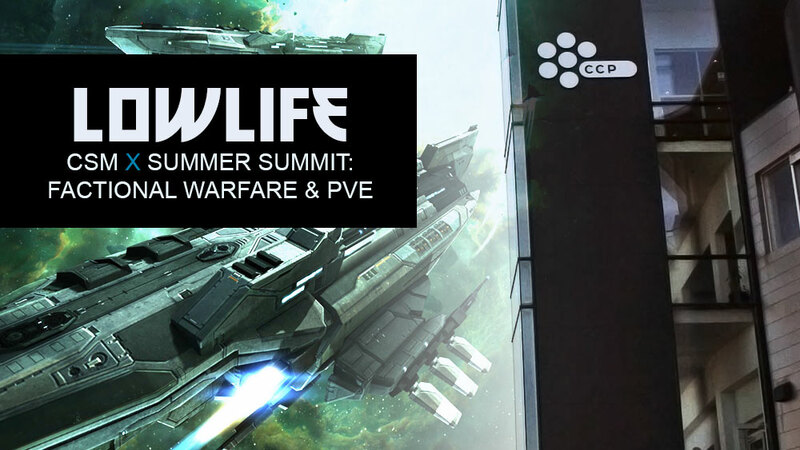 If I’m not mistaken, this is the third summit where Sugar Kyle and other CSM members have been on CCPs case about how broken FW missions are and that they need to be fixed. At Fanfest this year, I was in the room when CCP Affinity promised the FW community new missions by the end of 2015. CCP RedDawn is on the case at present and should have no issue with finding feedback because this has been discussed by the players for years now. We can only hope that CCP manage to deliver on Affinity’s promise. What worries me here is that the word “rebalance” was used, rather than “revamp” or something to that effect. It might just be so that it will be the same tired old missions, with some adjustments to even the playing field between factions. After Fanfest, I and many others were under the distinct impression that the missions would be redone, not just balanced. Time will tell which is true. Another returning favorite: the much anticipated four-way war. This is a thing CCP have asked us if we want for years, always receiving a resounding “YES”. Unfortunately, nothing concrete was presented at the summit, only that this is something they want to do. What that means in practice it anyone’s guess. Both CCP and the players believe that this will generate more PvP content and open the possibilities for more PvE, but it seems CCP are dragging their feet. This might be understandable because it is dependant on a lot of things working properly so it doesn’t end up breaking FW, and for the past year or so much of CCPs focus has been directed elsewhere. Earlier this year, at the Factional Warfare roundtable at Fanfest, CCP Affinity also mentioned that the new AI, initially used by the Drifter NPCs, would rolled out to FW first. This would be the first real testbed of the new system. The way CCP have chosen to do this is NPC convoys that will patrol the war zones at first, later expanding to other areas of space. The patrolling convoys will not only be engageable by the players, but will also engage each other. Presumably, they will act as a form of faction NPC militia and provide a new design space for PvE content and rewards. According to CCP Paradox, they are working on giving the NPCs memory, allowing them to follow and re-engage, even perhaps jump gates at some point in the future. There’s certainly a lot CCP could do with the powerful new AI when it comes to straight up content, but it could also be used as a balancing tool in order to influence player behaviour. A more intelligent, predatory NPC behaviour will also mean that the gap between PvE and PvP is shrunk, which must be a good thing. Two major hurdles that stand in the way of players who want to try Factional Warfare are the standings requirements and the fact that you cannot join a militia while in a player corp unless your entire corp or alliance enters FW. CCP are looking into changing this so that instead of a corp or alliance joining a militia, they can choose to just affiliate themselves to one. This means that their members are free to join said militia on a personal level. CCP Affinity also said that they would want to remove standings from the FW equation completely. That last part is most interesting because reworking standings in FW could potentially fix the much maligned AOE weapon problem. FW pilots are basically excluded from being able to use AOE weapons such as smartbombs and ECM bust because hitting friendlies would tank their standings so hard that they could potentially be kicked out of the militia after one fight. The issue that arises from removing standings altogether is that awoxers don’t have to worry about it either and that could in turn create very fragmented militias that would be extremely difficult for newer players to navigate. Most players don’t seem to think that this will be a problem however. Affinity also mentioned that restrictions would be put in place alongside the removal of standings requirements so that people could not hop between militias to farm LP. People that care about security status loss are pussies, let’s get that straight first. If you can’t take the heat, get out of the kitchen, tourist. Joking aside (sort of), security status hits when firing first on neutrals that enter your plex has been an issue that the Gorski Car and Sugar Kyle have brought up to CCP before. The main argument has been that players, especially new ones, tank their security status and effectively lock themselves out of operating in highsec. The solution is to give a short suspect timer to anyone entering a plex and CCP Affinity confirmed that this would indeed be happening. When Tech III destroyers were first introduced, CCP Fozzie made it clear that they would be let into Small complexes on probation, but that could be revoked depending on if they were oppressive to fighting in them. Since then, they have been nerfed and are looking at another balance pass in the near future, to be based on feedback from a form of focus group of players as announced by Fozzie and discussed by Gorski here on CZ yesterday. However, at this time CCP have determined that they are too oppressive to fighting in Smalls and will be booted out. Unlike Gorski, I’m not sure I agree with this change. I think it might stifle content for one of the coolest ship classes CCP have ever created. Adjust the price, balance the ships again, sure, but let them into Smalls. By all accounts it looks like they will be nerfed again, removing them from Small plexes as well might be a mistake. I would tentatively suggest that they either be balanced/nerfed or expelled from smalls, but not both. Especially if assault frigates are being looked at again.